Otto was about 5 when we met him at a pet store the SPCA was using for adoptions. 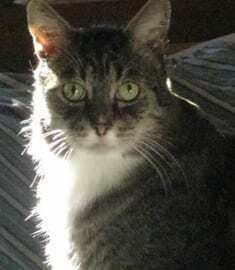 He was a big beautiful affectionate boy that my wife fell in love with the moment he said hello and we brought him to live in his forever home March 19, 1999. A “king” among kings, Otto was the big dog cat in every room he entered making an indelible impression on everyone he met. Otto’s favorite pastime was going for walks with us at his side, saying hello to neighbours and strangers at every opportunity, his personality and energy larger than life itself. There was no doubt he loved us as much as we loved him; his favorite words were “come cuddle” for the rare time he wasn’t following us from room to room to be at our side. We shared exactly 15 wonderful years of love, joy and happiness together. In Feb 2014 when our vet told us he didn’t have much time left, I asked my friend if he could try make it to our 15th anniversary together and he did just that, passing away on March 19, 2014. A last act of love from such a special soul.